The YGC has a state-of-the-art gliding simulator suite. It provides the opportunity for students, solo pilots and instructors to fly on days when we can't contemplate getting anything out of the hangar, usually due to the weather! The simulator is flown from an actual two seater glider body and uses its native controls. Three projectors are used to obtain a wide angle view of the photorealistic scenery. The flying characteristics of the glider are very accurately simulated as are the thermal and ridge air currents we use to get around in the real world. 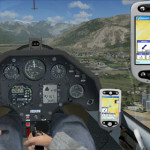 In all, highly realistic for beginners and experienced pilots. The simulator is a very useful tool when it comes to some aspects of flight training such as aerotowing and launch failures. It can add greatly to training and at the same time reduce overall costs. We have also set up two challenges for solo pilots; an out-and-return flight to Carlton Bank (CAR) and the SUT-POC-RUF-SUT (Sutton Bank - Pocklington - Rufforth - Sutton Bank 100 km) triangle. So far, the best speed to CAR and back is an average of 102.5 kph. This is a really good task for a rainy afternoon as it only takes about 30 minutes, providing lots of scope for a small group to engage in some friendly competition. We have loaded all the flights into the computer, so they appear as other gliders in the sky with you. Keep a good lookout! The simulator is available for use by club members and pre-booked visitors. If you'd like to come and have a go in it, please ring the office on 01845 597237 to make a booking. We'll have a qualified instructor on hand ready for you.